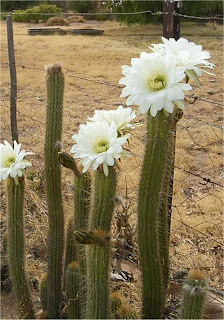 As well documented on many websites, it is a cactus like plant that grows in semi desert conditions in Southern Africa and has been eaten by the Bushmen partly to curb hunger and thirst during long hunting expeditions. Is Hoodia gordonii a cactus ? A young plant of Hoodia gordonii in flower. 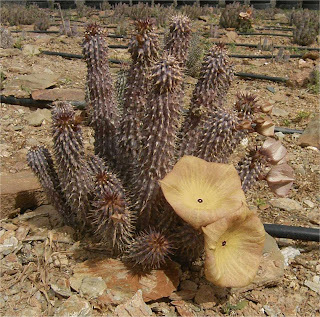 Hoodia gordonii is native to Southern Africa. 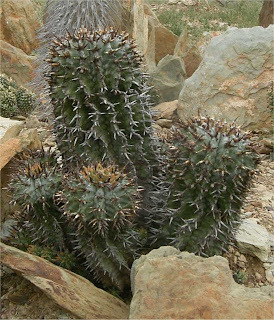 Euphorbia horrida from South Africa. Euphorbias belong to the spurge family. Many species and forms, including trees and shrubs belong to this family. Euphorbias are wide spread in many parts of the world.